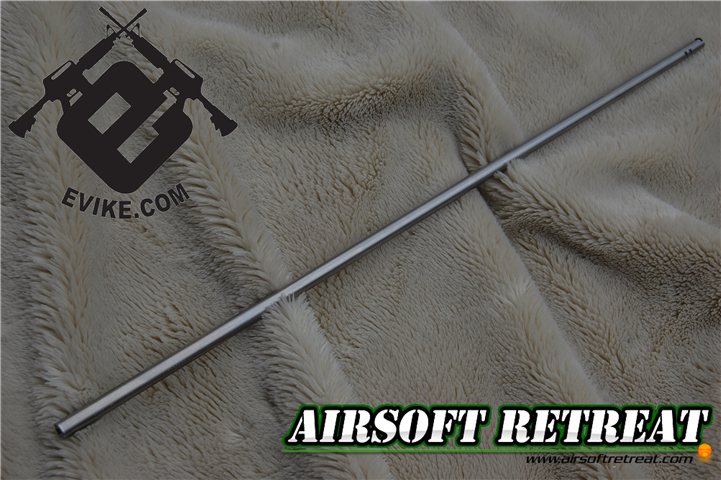 Angel Customs is a manufacturer of high quality internal and external parts, and today I'm going to be reviewing one of their stainless steel tightbore inner barrels. Angel manufactures these barrels in a variety of lengths, from 110mm MP5K length all the way to 650mm PSG1+, with pretty much every AEG in between covered. I will discuss all of the various pros and cons of these barrels in this review! I was sent this barrel by Evike, who has recently started carrying pretty much all of Angel's products. The various barrels are priced between $32 and $53, depending on length. This model, the 510mm length unit, is available HERE, priced at $50. The rest of the barrels can be found HERE. From what I can see, they only have AEG cut barrels currently, but they are producing several bolt action parts, so I wouldn't be surprised if they started selling VSR cut barrels soon. Evike packaged the barrel well for shipping inside a cylindrical tube package with bubble wrap inside, keeping it safe during transit. Angel Customs manufactured this barrel out of stainless steel, both for strength and durability. It is listed as having a 6.01mm inner bore, which is much tighter than most stock inner barrels, as well as many aftermarket inner barrels. As mentioned before, you can get these in pretty much any length that you might need for your AEG. Angel Customs packages their inner barrels inside a clear plastic tube, like most inner barrel manufacturers. At the ends of the barrel, they've inserted small rubber plugs, to protect the muzzle and hop-up openings from damage during shipping. This is a small touch, but it shows that they care enough about their product to keep it safe. There are two stickers on the tube, one indicating that it is made by Angel Customs, and one indicating the length. 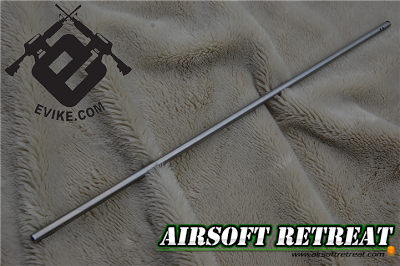 There's really not too much to say about the barrel that hasn't already been said in this review, however, I will stress the fact that it is made out of stainless steel, which is one of the preferred materials to make inner barrels out of. To help you keep track of the length and bore of your barrel, Angel laser engraved the barrel with that information. At the hop-up end, you'll notice that it has two notches for locking in the hop-up. The hop-up window is cut at an angle, which can help prevent damage to the bucking by reducing the sharp edges for it to contact. At the muzzle end of the barrel, you'll find that it has deep crowning, which helps prevent accuracy issues when firing. It does this by providing a smooth path for excess compressed air to escape around the BB at the moment it exits the barrel. This effect is more pronounced on real firearms, of course, but in theory, it works for airsoft too. The inner bore of the barrel is very highly polished, and is without any defects that I can see. It is an extremely smooth bore, and a BB slides smoothly down it. When you place a BB in the barrel, cover the muzzle with your finger, it takes a very long time for the BB to slide down the barrel, indicating that the barrel has a very tight bore. The barrel may be pretty, and it is made of great materials, but that's not any good if it doesn't increase the performance of your gun. Luckily, that is not the case with this barrel, as I saw a noticeable increase in FPS and range, as well as a decrease in grouping size. For testing purposes, I installed the barrel in my Javelin M4 based custom rifle. You can see the review of the stock gun HERE. Since the review, I had installed the M16 length outer barrel, as well as a Javelin 500mm inner barrel, that I took from my Javelin AK project gun. After swapping in the longer inner barrel, I saw an increase in FPS from about 376 to 380 consistently. This gave me a decent starting place for testing the new barrel. Before installing the barrel, I cleaned it with a cleaning rod and patch to remove any excess oils from the manufacturing process, and was pleased to see that the patches came out quite clean. Installing the barrel was a piece of cake, as it fit perfectly inside the hop-up unit and the outer barrel. The length was perfect for my M16 length outer barrel, and went right up to the end of the muzzle threading, leaving no wasted outer barrel length. After installation, I shot two hi-caps through the gun with Matrix .20g BBs, to break in the barrel, and remove any tiny burrs that might have existed. I did a quick chrono test before breaking in and afterward, and saw no difference in the results, so it doesn't appear that this barrel will require any break-in before use. Chrono results, using Matrix .20g BBs came in between 402.6 and 404.2 FPS, an increase of 20 FPS on average over the same length, but stock bore inner barrel, and with increased consistency. This is to be expected with a tighter bore, as less air gets wasted bypassing the BB. Accuracy and range increased as well with this barrel. With the stock bore M16 length barrel, I was able to hit a torso sized target at 165' 90% of the time, and after installing the Angel barrel, I saw that range increase to 175', using .28g BBs. This increase in effective range can be attributed to the increase in velocity, however, there was a lot less side to side deviation in my shots compared to the stock bore barrel. As you can see, the grouping tightened up substantially with the Angel barrel vs. the stock bore barrel. At short range, most of the deviation is from top to bottom, with side to side being quite tight. Grouping size with the Angel TBB was about 2.9”, with the stock barrel being closer to 5”. Overall, you can see that the performance was greatly increased across the board using the Angel 6.01mm tightbore barrel. I saw an increase in velocity, consistency, usable range, and precision. For the price, this thing gave me one of the best bumps in overall performance that I've seen. Angel Custom has produced a few products recently, and if they're half as good as their inner barrel, they are going to be a force to be reckoned with. This thing is extremely well made, and gives you real, measurable performance increases across the board. It is easy to install, inexpensive, and gives you more useable performance for skirmish use. I'm very excited to see what else Angel has in store for the airsoft market!